For those labouring under the misapprehension that Jimmy Cooper’s Lambretta of Quadrophenia fame was laid to rest under a Post Office van, as in the immortal words: “You Killed my Soota!” Must not believe all you see down at the cinema. To burst a few more bubbles, Jimmy did not go over the cliff on the Ace Face’s GS, as the dear chap appeared recently as one of the cast of the East Enders soap – still playing Jimmy (almost! ), as it happened. This is only part of the largely unsung history surrounding the auctioning off of Jimmy’s scooter at a top class London auctioneers. The truth about the scooter is even more of a tangled web. Unlike the Sting ‘GS’s that were owned by the Who Productions film company, the majority of the starring scooters of Quadrophenia were hired for the job in hand. There actually had to be two Jimmy scooters, as the owner might have taken umbrage at his pride and joy being unceremoniously and terminally ditched on the tarmac in one scene? The Lambretta seen trashed under the Post Office van, if you look carefully, is actually not a standard Series three, but the more up-market ‘Li Special’. After the film Jimmy’s Lambretta had a somewhat chequered career. At one time the scooter, graced the showroom of the Portsmouth Lambretta dealer, Rafferty Newman, having been, allegedly, gifted to them in exchange for a brand new GP150 by the then owner. Lambretta supply was on the ebb and the Jimmy scooter was sold on locally at least twice. Sadly, after market scooters had little value at the tail end of the 70’s and early 80’s and this part of film history finally became resident in a front garden in Southsea, near Portsmouth. This now tired machine was recognised for what is was by Kev Percival. In 1983 Kev was only a fifteen-year-old schoolboy doing a milk round for pocket money, so Kev secured yet another job as a paper boy and sold his Hornby train set to gather as much money as possible for the purchase of his dream. Kev ended up with £80 and, despite the asking price for the scooter being £120, successfully negotiated a large discount on the sale. Kev paid £80 for Jimmy’s scooter! His Mum, as you might imagine, viewed the arrival of a somewhat dubious motor scooter at Kev’s home with dismay? The first stage of the Jimmy’s scooter as a restoration project was a big problem for a schoolboy, but Kev had a bright idea and begged to be excused the woodwork classes at his school and substitute metalwork instead. The scooter then became Kev’s very special project in the metalwork room. Time moved on and Kev was employed at Rafferty Newman’s until the company divested itself of its unfashionable Lambretta spares dealership allowing Kev and his long time friend, Gary Wells, to start up the Allstyles scooter shop that we all recognise to this day. In 1995, with the help of many cans of aerosol, the restoration to today’s offering was completed and Jimmy’s Lambretta formed a very effective mobile advertisement for Allstyles. The scooter has also won awards at custom shows and appeared at promotional events. When Quadrophenia was re-released in January 1997 Jimmy’s Li attended the premiere in Brighton where it was reunited with Phil Daniels and other members of the original cast. 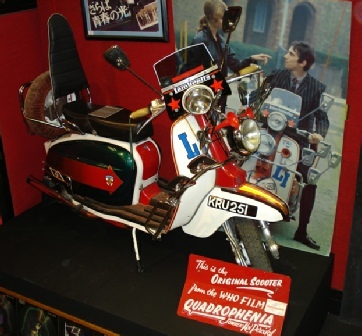 Later the same year the Jimmy scooter was used for the filming at the Who’s Quadrophenia concert in Hyde Park, London. The authenticity of this Lambretta has always been the hot topic surrounding this the most iconic scooter of all time…Jimmy Cooper’s Series three Lambretta Li 150 from the film Quadrophenia. The authenticity problem has been compounded over the years by displaying this Lambretta side by side with a Sting ‘GS’ clone at the premises of Allstyles Scooters. This may well have raised the original question of the provenance of the ‘Jimmy’ scooter? A local rumour was that the original scooter was actually written off in a traffic accident, so the Allstyles scooter must be a look-alike? Neither of these ‘facts’ helped matters. Now the London auction house of Bonhams was selling the scooter, so the originality of the machine became most important, as the sale price was predicted at £20,000 to £25,000. Happily, there is documentation to lay any ghosts surrounding the provenance of Jimmy’s Lambretta. This documentation is in the form of the original hire slip written out by the filmmakers, which records paying £350 to a John Wazinski, then a member of the Modrapheniacs scooter club, for the loan of a scooter for the duration of the filming. On this receipt this scooter is described as green and red Lambretta with the registration number KRU 251 F and the ‘chassis identity number’ (they meant frame number, of course?) was recorded as 742146. Bonham’s have carefully photographed the frame numbers of the Jimmy scooter, including transferring the prints to an easily readable negative format, and - everyone will now be relieved to know - that this information checks out with the film documentation? Also, for any unbelievers, so clear are the pictures of the frame numbering that any past tampering would have shown up as obvious. This is visibly not the case. The Lambretta up for auction was Jimmy’s scooter. There was no mistake! The front crash bars differ in that lower attachment brackets were chosen for the restoration; the originals were bolted through the bodywork flare. The front fork embellishers are a different, but very similar, type to the film offering. The front sticker on the leg shield was from the Southend 1978 rally. A Lambretta sticker was stuck over this date for the filming. (Incidentally, extras for the filming were recruited at this rally). Kev had to substitute a similar looking sticker featuring the Lambretta logo. The horns are plastic. The originals would have been Fiamme metal horns sprayed red. The reason for this change is that the Fiamme horns – or one of them, at any rate – was vandalised at a rally and the plastic horns were the only obtainable substitutes. The seat was a Ken Cobbin aftermarket accessory seat and would have incorporated a star badge. However, this list does not constitute criticism of the original restoration, which is stunning in itself. The list merely points out deviations from the film version of the scooter. There is only one true point of concern in the use of non-original parts and one that has raised its ugly head in past articles, but is potentially life threatening should any Lambretta venture onto the road. This is the fitment of Vespa type inner tubes with their right-angled valves. In recent years it has, once again, become possible to obtain the correct stile 30-degree bend valved tubes for Lambrettas. This was not possible at the time of the rebuild. The 25th November 2008 was to be the day Bonham’s auctioneers in Knightsbridge sold on a piece of film and scootering history. The Bonham’s sale catalogue projection of a £20 – 25,000 price on Jimmy’s scooter, so it was not surprising to find the auction room packed with bidders as well as an eager audience of film buffs and representatives of the scooter world. Kevin was there in person, having a fag outside, as he waited with anticipation tinged with a large amount of sadness, as this last part of his once busy scootering life was about to go under the auctioneer’s hammer. Bidding started at 3.50pm with a tag of £1,200, swiftly rising as the £100 increment bids took the price up to £20,000. The bidding raced past the £25,000 barrier. This is where the adrenaline kicked in and the heart rate went up! The bidding peaked at £30,000 with the auctioneer offering the scooter around the room for higher bids. It was not to be… Down came the hammer - £30,000….Sold! And all in two minutes flat. The proud new owner was Tony Cochrane from Dundee. Most of our readers will be relieved to hear that this part of our scootering tradition is to stay in the UK? Tony has a firm interest in the film Quadrophenia and his purchase has fulfilled a dream of his. It was nice to see both Kev and Tony exchanging phone numbers in friendly conversation, as well as giving Kev the chance to make sure that his pride and joy was going to a good home. Kev, we are happy to relate, left a little saddened by his loss, but – at the same time – happy with the scooter’s new owner. Those thinking of turning up and bidding at future Bonham’s sales might like to note that there is a Buyer’s premium of 20% on all sales under £250,000, so the actual cost of Jimmy’s scooter was actually £36,000!